What it is: Like wisdom teeth that become “impacted” and won’t erupt into the mouth, other teeth can be prevented from erupting because of crowding, an atypical eruption path or an unusual tooth position. However, unlike impacted wisdom teeth which are often removed because of insufficient space in the mouth, many other impacted teeth require treatment to allow them to be brought into the mouth in an ideal position. The upper canine teeth are the teeth which most frequently become impacted. Sometimes a patient being treated for an impacted tooth / teeth also has severe crowding and may require extractions of other teeth. Treatment: Often, the treatment of choice is to create space for the impacted tooth / teeth with braces, have the impacted tooth / teeth surgically uncovered by a surgery specialist, bond an attachment to the tooth / teeth and gradually pull them into place. Once the treatment is complete, the patient has the braces removed and a beautiful smile with his/her own natural teeth in place. What it is: Young patients in the mixed dentition who have imbalances between the upper and lower jaws might be treated with functional appliances. Functional appliances are appliances that are used in young growing patients (typically between the ages of 9 to 12 years old) to address problems where there is an imbalance in jaw growth—i.e. the lower jaw is smaller and further back, the upper jaw is bigger and further forward, or at times when the lower jaw is larger and too far forward. The aim is to allow for a more synchronized growth of the jaws whereby the smaller lower jaw can “catch up” to the upper jaw, and the upper jaw growth is restrained or restricted. Treatment: This is usually done as a Phase I treatment in the mixed dentition (not all permanent teeth have yet erupted) as a child is going through their most pronounced growth spurt. This treatment is often best followed by a Phase II treatment with complete braces (when all of the permanent teeth have erupted) to finalize the correction that has been started with the functional appliances. The braces will allow for the best fit of the upper and lower teeth together which is the most ideal way to stabilize the correction carried out in Phase I treatment. 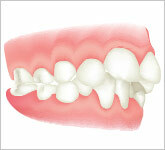 What it is: Patients can present with malocclusions that are the result of asymmetric growth of one or both jaws. There is a marked asymmetry in the facial features where it is visually apparent. Sometimes the asymmetry is only obvious intra-orally. 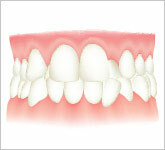 Treatment: If the patient is an adult and the asymmetry is pronounced enough that the patient would like to have it corrected, we often need to proceed with treatment involving a combination of braces and jaw surgery (which is performed by the oral surgeon approximately midway through the “braces” treatment). This could involve surgically moving the lower jaw laterally and/or vertically, often in combination with surgery to the upper jaw, as shown in this patient. If, on the other hand, there is an asymmetry of the lower jaw which is not pronounced, the options are either to just treat orthodontically without any surgical intervention, or in conjunction with a minor procedure to the chin (genioplasty) to mask the asymmetric lower jaw. What it is: An open bite refers to a malocclusion whereby the upper and lower anterior teeth do not meet or overlap vertically. Essentially one cannot tear food with the anterior teeth as a result of these teeth not being able to touch. Such a malocclusion is often seen at a very young age and is one of the most challenging to correct. Treatment: When the cause of the open bite is identified and eliminated, and the patient is young enough (pre-pubescent), we can often get an improvement or complete correction of the open bite. In this example the patient is 8 years old. An open bite of this degree in an adult would almost certainly require jaw surgery to correct. The cause for such an open bite might be genetic growth pattern, a history of or an ongoing thumb sucking (two words) habit, or chronic mouth breathing (two words). In the latter two causes, elimination of the thumb habit and referral to an ENT specialist to evaluate the airways might be all that is needed to address the problem. In some cases we need to go on to a “habit breaking appliance” or some other type of orthodontic treatment to close the open bite. 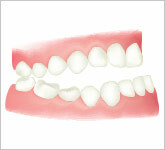 What it is: Permanent teeth can at times have unusual sizes and shapes. The most common example of this is the upper lateral incisor which will be smaller than usual (as shown in the example). This condition is described as having “peg lateral incisors”. Treatment: In cases where the size discrepancy is significant, the orthodontist will treat the patient’s malocclusion by moving all of the teeth in their most ideal positions in order to achieve the best bite and esthetics. At the end of treatment, the patient’s general dentist or a specialist will do a “build up” of these small unusual teeth to restore the typical size and shape. This can be done with the use of composite bonding, a porcelain veneer or a porcelain crown. The example shown is one where composite bonding was used to augment the size of both lateral incisors. 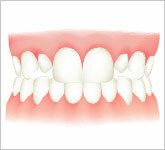 What it is: Class III malocclusions describe when the lower anterior teeth close ahead of the upper anterior teeth. Often, this is a skeletal problem, whereby the lower jaw is bigger than the upper jaw, or the upper jaw is smaller than the lower jaw. 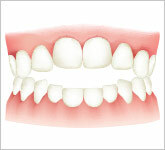 This malocclusion can be accompanied with a vertical discrepancy, such as an “open bite” (where the upper and lower anterior teeth do not vertically overlap, as shown in this example) or a deep overbite (the upper and lower anterior teeth cover each other vertically excessively). Treatment: When the malocclusion is severe, it requires not only orthodontic treatment for correction, but jaw surgery as well. After approximately one year of braces, the patient is treated by the oral surgeon to have jaw surgery: the lower jaw is moved back, the upper jaw is moved forward or a combination of both. 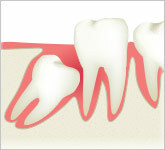 What it is: Dental crowding occurs when a person’s jaw is too small to accommodate all of his/her permanent teeth. This lack of space results in teeth that are rotated, overlapped, or prevented from erupting altogether. This can result in a bite that is not functionally healthy and can be a cosmetic shortcoming for a person. In children with severe crowding sometimes early treatment can help us avoid extractions. 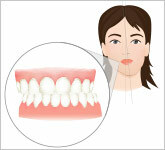 Treatment: Many patients seek orthodontic treatment to align crooked and crowded teeth. The decision that the orthodontist must make in evaluating such a patient is whether or not he / she can align all of the teeth without extracting / removing any permanent teeth. The factors to consider in making this decision are the severity of the crowding, the bite, the thickness and height of the gingiva (“gums”), and whether or not these teeth are already too pronounced (leaning outwards) in the jaws. Certain patients are best treated with braces and the extraction of teeth in order to correct the alignment of the teeth, improve the bite, improve the health of the gums and enhance the smile. Need more information on orthodontics?Consult Bücco Ortho and find the answers to your questions.